American Museum of Natural History (New York City). 1986 Dual organization and calendars inferred from the planned site of Azangaro: Wari administrative strategies. Unpublished Ph.D. dissertation, Cornell University. 1968	Art of ancient Peru; an exhibition organized in cooperation with Alan C. Lapiner, December 7, 1968 to January 9, 1969. New York. 2001 Textiles del Horizonte Medio, Las Evidencias de Huaca Malena, Valle de Asia	Boletín de Arqueología PUCP 4:401-424	Lima. 1968	Pre-Columbian art and later Indian tribal arts. Harry N. Abrams, New York. Arriola Tuni, Carlos A. and Louis D. Tesar. 2011 The Pikillacta 2004 eastern gate offering pit. Ñawpa Pacha 2011(30)(2):1-44. 1984 Culturas precolombinas: Huari. Banco de Crédito del Perú, Lima, Perú. 1977	Peru before Pizarro. Phaidon, Oxford. 1987	Healers of the Andes: Kallawaya Herbalists and Their Medicinal Plants. University of Utah Press, Salt Lake City. 1982	The Andean Heritage. Peabody Museum of Archaeology. Harvard Press:Cambridge, Mass. 1983	Caracter del estado Wari. Universidad Nacional de San Cristóbal de Huamanga, Ayacucho, Peru. 1999	Tejidos Wari. En: Tejidos Milenarios del Perú “Ancient PeruvianTextiles” pp 353-411 Edit. Compañía de seguros AFP Integra. Lima. 1963  Archaeology of Central Andes, In:	Handbook of South American Indians, v.2: The Andean civilizations,	edited by Julian H. Steward. Bureau of American Ethnology, Bulletin 143, Smithsonian Institution, Washington, D.C.
1953	Excavations at Wari, Ayacucho, Peru. Yale University Publications in Anthropology, No.49, New Haven. 1954	Ancient Arts of the Andes. Museum of Modern Art, New York. 1974	A Man and a Feline in Mochica Art. Dumbarton Oaks, Washington, D.C.
2000	Tiwanaku: Lords of the Sacred Lake	Museo Chileno de Arte Precolombino. Santiago. 1999 Pattern and Paradigm in Middle Horizon Tapestry Tunics. Unpublished PhD dissertation. Columbia University, Graduate School of Arts and Sciences. 2012 Figurines. In: Wari: Lords of the Ancient Andes, edited by Susan E. Bergh, pp. 232-241. Thames and Hudson and Cleveland Museum of Art. 2012 Wood Containers and Cups. In: Wari: Lords of the Ancient Andes, edited by Susan E. Bergh, pp. 242-247. Thames and Hudson and Cleveland Museum of Art. 1990 Prehispanic Household and Empire at Lukurmata, Bolivia (2 vols.) Unpublished PhD dissertation. The University of Michigan, Department of Anthropology. 1994	Lukurmata: Household Archaeology in Prehispanic Bolivia. Princeton University Press, Princeton, New Jersey. 2003 The Archaeology of Households in Lukurmata. In:	Tiwanaku and Its Hinterland: Archaeology and Paleoecology of an Andean Civilization, Vol.2 - Urban and Rural Archaeology,	edited by Alan L. Kolata. Smithsonian Institution Press, Washington. 1962 Art and Life in Old Peru: An Exhibition. Curator: The Museum Journal, 5: 147–210. 1961	25 centuries of Peruvian art, 700 B.C. - 1800 A.D.	Peabody Museum, Harvard University. 1999	Weaving for the Gods: Textiles of the Ancient Andes. Bruce Museum of Arts and Science, Greenwich, Conn.
1990	Moraduchayuq: An administrative compound at the site of Huari, Peru. PhD Dissertation, SUNY-Binghamton. Brooklyn Museum of Art (New York City). 1994	Ancient South America. Cambridge University Press, Cambridge. 2001 La cerámica de Tiwanaku: qué indica su variabilidad? En,	Huari y Tiwanaku: Modelos vs. Evidencias, segunda parte,	edited by Peter Kaulicke y William H. Isbell, pp.217 - 249. Boletín de Arqueología PUCP, no.5, 2001. Fondo Editorial, Pontificia Universidad Catolica del Peru, Lima. 2000 La presencia de Wari en San José de Moro. In Huari y Tiwanaku: Modelos vs. Evidencias, primera parte,	edited by Peter Kaulicke and William H. Isbell, pp. 143-179. Boletín de Arqueología PUCP, no.4, 2001. Fondo Editorial, Pontificia Universidad Catolica del Peru, Lima. 1992 The conventionalized rules in Pucara pottery technology and iconography: Implications for socio-political developments in the northern Lake Titicaca basin. Unpublished PhD dissertation. Michigan State University, Department of Anthropology. Image: Fig. 197a	See: Bird: Owl or Eagle? 1985	Funerary offerings from a Middle Horizon context in Pomacanchi, Cuzco. Ñawpa Pacha	22-23 (1984-1985): 1-48. Tipos de tumbas y fardos en los diferentes estratos, estudiados en una area de 130 m. de largo por 16 m. de ancho a partir de la falda Este del montículo "K." hacia el lado Sur. In:	Manual de arqueología peruana,	by Federico Kauffmann Doig. Ediciones Peisa, Lima. Pp.434-435. 2001	A Field Guide to th Birds of Peru. Ibis Publishing Company, Temecula, CA. 1991 Tiahuanaco and Huari: Architectural Comparisons and Interpretations. In:	Huari Administrative Structure: Prehistoric Monumental Architecture and State Government,	edited by William H. Isbell and Gordon F. McEwan, pp.281-291. Dumbarton Oaks, Washington, D.C.
1979 The Iconography of Empire: Symbolic Communication in VII Century Peru. Unpublished MA Thesis, Department of Anthropology, State University of New York at Binghamton. 1985 Art and time in the evolution of Andean state expansion. Unpublished Ph.D. Dissertation, Department of Anthropology, State University of New York, Binghamton. 1987 The Middle Horizon Ceramic Offerings from Conchopata	Ñawpa Pacha 22-23:49-90. 1994	Wari y Tiwanku: entre el estilo y la imagen. Pontificia Universidad Catolica del Peru, Lima. 1974 Testimonianze d'arte delle culture peruviane primitive. Studio d'arte Mazzoleni, Milano. 2003 Putuni: A History of Palace Architecture at Tiwanaku. In:	Tiwanaku and Its Hinterland: Archaeology and Paleoecology of an Andean Civilization, Vol.2 - Urban and Rural Archaeology,	edited by Alan L. Kolata. Smithsonian Institution Press, Washington. 1998	Birds of Southern South America and Antarctica. Collins Illustrated Checklist, Harper Collins Publishers, London. 1967	Daily life in ancient Peru. Translated from the German by Alisa Jaffa. McGraw-Hill, New York. 1968 An Association of Middle Horizon Epoch 2A Specimens from the Chicama Valley, Peru. Ñawpa Pacha 6:15-20. 2003	Owls of the World: Their Lives, Behavior and Survival. Firefly Books, Buffalo. Image: See: Bird: Owl or Eagle? Durán, Eliana S., María Fernanda Kangiser G. y Nieves Acevedo C.
2000 Colección Max Uhle: Expedición a Calama 1912. Publicación Ocasional 56, Museo Nacional de Historia Natural, Chile. 1980	Altperuanische Kulteren: Tiahuanaco III	Museum für Volkerkunde, Berlin. 1969	Art of Ancient Peru	an exhibition organized in cooperation with Alan C. Lapiner, December 7, 1968 to January 9, 1969. New York, André Emmerich Inc., 1969. 2003	Montez Collection, Waka Site, W.M. Jaime farm, Ayacucho. Digital photo provided by Patrick Ryan Williams. 1990	Birds of the High Andes: A Manual to the Birds of the Temperate Zone of the Andes and Patagonia, South America. University of Copenhagen and Apollo Books, Svendborg, Denmark. 1929	Art Precolombien. Hotel Drouot, Paris. 2011 Señor Wari de Vilcabamba. Paper presented at the 30th	Northeast Conference on Andean Archaeology and Ethnohistory, Andover, MA. 1967 The Ancient Pottery from Pucara, Peru. Revised version of Senior Honors Thesis, Department of Anthropology, Harvard University. Cambridge. 1990. The Ancient Pottery from Pucara, Peru. —awpa Pacha 24(1986): 1-30. Giersz, Miłosz, Cecilia Pardo, Krzysztof Makowski, Patrycja Prządka-Giersz, Pamela Castro de la Mata. 2014	Castillo de Huarmey. El Mausoleo Imperial Wari. Museo de Arte de Lima, Peru and Uniwersytet Warszawski, Poland. 1996 The Wari occupation of the southern highlands of Peru: A ceramic perspective from the site of Pikillacta. Unpublished PhD Dissertation, Department of Anthropology, Brandeis University. 2005 Dating Pikillacta, In:	Pikillacta: the Wari Empire in Cuzco, eited by Gordon F. McEwan, pp. 115-124. Univeristy of Iowa Press, Iowa City. 2005 Food of the Gods or mere mortals? Hallucinogenic Spondylus and its interpretive implications for early Andean society. Antiquity 79(304): 257-268. 2012 Shattered Ceramics and Offerings In: Wari: Lords of the Ancient Andes,	edited by Susan Bergh, pp. 144-157. Thames & Hudson, New York. 1977 Conchopata: La destrucción de una zona arqueológica. In La Imagen Cultura. Ayacucho, Perú. 1993 Child Nutrition and Seasonal Hunger in an Andean Community (Department of Puno, Peru), Working Paper Number 6, Production, Storage, and Exchange in a Terraced Environment on the Eastern Andean Escarpment. Series editor, Bruce P. Winerhalder, UNC- Chapel Hill. 1924 La céramique ancienne du Pérou. Éditiones Albert Morancé. Paris. 2002 Phoebe Apperson Hearst Museum, Berkeley. Courtesy of the Phoebe Apperson Hearst Museum of Anthropology and the Regents of the University of California - photographed by Pat Knobloch 4-6033. 2002 Phoebe Apperson Hearst Museum, Berkeley. Courtesy of the Phoebe Apperson Hearst Museum of Anthropology and the Regents of the University of California - photographed by Pat Knobloch 4-2564b. 2002 Phoebe Apperson Hearst Museum, Berkeley. Courtesy of the Phoebe Apperson Hearst Museum of Anthropology and the Regents of the University of California - photographed by Pat Knobloch 4-4556. 2002 Phoebe Apperson Hearst Museum, Berkeley. Courtesy of the Phoebe Apperson Hearst Museum of Anthropology and the Regents of the University of California - photographed by Pat Knobloch 4-9061. Nuevo tipo de tumba descubierto en las Necropolis de Ancón. Revista del Museo Nacional de Antropología y Arqueología,	2(1) (1st):93-98. Lima. 1977	The rural foundation for urbanism: Economic and stylistic interaction between rural and urban communities in eighth-century Peru. University of Illinois Press, Urbana. 1989	Honcopampa: Was It a Huari Administrative Center? In:The Nature of Wari: A Reappraisal of the Middle Horizon in Peru, edited by R. Michael Czwarno, Frank M. Meddens, and Alexandra Morgan, pp. 98-115. International Series, 525. Oxford: British Archaeological Reports. 2000 Repensando el Horizonte Medio: El caso de Conchopata, Ayacucho, Perú. In Huari y Tiwanaku: Modelos vs. Evidencias, primera parte,	edited by Peter Kaulicke and William H. Isbell, pp. 9-68. Boletín de Arqueología PUCP, no.4, 2001. Fondo Editorial, Pontificia Universidad Catolica del Peru, Lima. 2002 Iwawi and Tiwanaku, In:	Andean Archaeology 1: Variations in sociopolitical organization. Edited by Helaine Silverman and William H. Isbell, pp.199-241. Kluwer Academic, New York. 2002 A new perspective on Conchopata and the Andean Middle Horizon. In:	Andean Archaeology II: Art, landscape, and society. Edited by Helaine Silverman and William H. Isbell, pp.249-307. Kluwer Academic, New York. 1991	Huari Administrative Structure: Prehistoric Monumental Architecture and State Government. Dumbarton Oaks Research Library and Collection, Washington, D. C.
2009	SAIS - The Origin, Development, and Dating of Tiahuanaco-Huari Iconography, In Tiwanaku: Papers from the 2005 Mayer Center Symposium at the Denver Art Museum. Edited by Margaret Young-Sánchez 2009, pp. 165-210. Denver: Denver Art Museum. 1994 State and Local Power in a Prehispanic Andean Polity: Changing Patterns of Urban Residence in Tiwanaku and Lukurmata, Bolivia. Unpublished Ph.D. Dissertation, Department of Anthropology, University of Chicago. 2003 Vessels, time and society: Toward a ceramic chronology in the Tiwanaku heartland, In:	Tiwanaku and Its Hinterland: Archaeology and Paleoecology of an Andean Civilization, Vol.2 - Urban and Rural Archaeology,	edited by Alan L. Kolata. Smithsonian Institution Press, Washington. 2010 Beyond Wari Walls: Regional Perspecives on Middle Horizon Peru. University of New Mexico Press, Albuquerque. 2010 Beyond Wari Walls, Chapter 1 In:Beyond Wari Walls: Regional Perspecives on Middle Horizon Peru. pp.1-18. University of New Mexico Press, Albuquerque. 1964 Art of Empire: The Inca of Peru. Museum of Primitive Art. New York. 1976	El Peru arqueológico: Tratado breve sobre el Perú preincaico. Ediciones G.S., Lima. 2001 Huari y Tiwanaku: Modelos vs. Evidencias, primera parte. Boletín de Arqueología PUCP, no.4. Pontificia Universidad Catolica del Peru, Fondo Editorial. 1946	Medieval American art: A survey in two volumes. Macmillan, New York. 2002 New Dates from the Huari Empire: Chronometric Dating of the Prehistoric Occupation of Conchopata, Ayacucho, Peru. MA Thesis, SUNY-Binghamton. 1974 Reconnaissance survey and mapping at Huari, Ayacucho, Peru by William H. Isbell, Katharina Schreiber and Patricia Knobloch (SUNY-Binghamton). Photo by W. H. Isbell. 1977 Huari urban prehistory project (HUPP), Ayacucho, Peru. Directed by W.H. Isbell, 1977-1980. 1985 Museum für Volkerkunde (MfV) [Ethnologisches Museum - Dahlem], Berlin. Funded by NEH travel grant. 1985b Staaliches Museum für Volkerkunde, München. Funded by NEH travel grant. 1986 Development of Huari Iconography: The Adoption of Ancient Symbols. Institute of Andean Studies (26th, Berkeley). 1991 Stylistic Date of Ceramics from the Huari Centers. In:	Huari Administrative Structure: Prehistoric Monumental Architecture and State Government,	edited by William H. Isbell and Gordon F. McEwan, pp.247-258. Dumbarton Oaks, Washington, D.C.
1999 Colecciones del Laboratorio de Arqueología, Universidad Nacional de San Cristóbal de Huamanga. 1999 Excavations at Conchopata. Directed by William H. Isbell (SUNY-Binghamton) and Anita G. Cook (CUA). 1999b Huari: Putting the Cosmo in Cosmopolitan	Paper presented at the 64rd Annual Meeting of the Society for American Archaeology, Chicago. 1999/2000 Museo de Huari, Huari, Peru. Instituto Nacional de Cultura, Perú. 2000a Cronología del contacto y de encuentros cercanos de Wari. III Simposio Internacional de Arqueología (18-20 agosto), Pontificia Universidad Católica del Perú. 2000c Colecciones del Laboratorio de Arqueología, Universidad Nacional de San Cristóbal de Huamanga. 1997/98 Excavations at Conchopata. Directed by José Ochatoma y Martha Cabrera. 2000d Tiwanaku, Bolivia. Ponce Stelae. Image: author's photos	See: Plant: A. Colubrina	Ponce Stelae. 2001 CronologÌa del contacto y de encuentros cercanos de Wari (based on paper given in 2000a). In Huari y Tiwanaku: Modelos vs. Evidencias, primera parte,	edited by Peter Kaulicke and William H. Isbell, pp. 69-87. Boletín de Arqueología PUCP, no.4, 2001. Fondo Editorial, Pontificia Universidad Catolica del Peru, Lima. 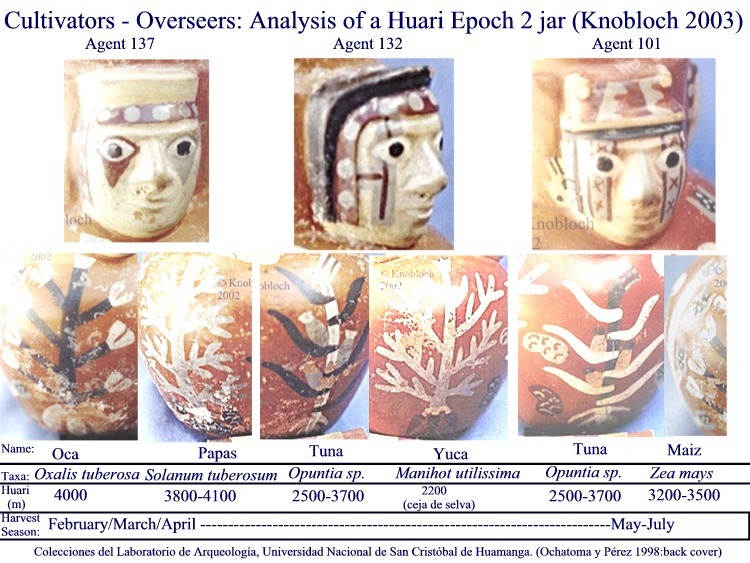 2003 Cultivators - Overseers: Analysis of a Huari Epoch 2 jar	1997/98 Excavations at Conchopata. Directed by José Ochatoma y Martha Cabrera. 2009 Conchopata Urn reconstructed drawing based on	Julio C. Tello 1942 excavated collection housed at the MNAAHP. Photos provided by William H.Isbell. 2010 La imagen de los Señores de Huari y la recuperación de una identidad antigua. In: Señores de los imperios del sol,	edited by Krzysztof Makowski, pp. 196-209. Banco de Crédito, Peru. 2012 Archives in Clay: The Styles and Stories of Wari Ceramic Artists	In: Wari: Lords of the Ancient Andes,	edited by Susan Bergh, pp. 122-143. Thames & Hudson, New York. 2013 Unraveling the mysteries. HALI 176:88-95. 2013 Photographs of the W.C. Bennett 1950 Collection at Yale Peabody Museum of Natural History. 1999	Owls: A Guide to the Owls of the World. Yale University Press, New Haven. 2003	Tiwanaku and Its Hinterland	Vol. 2: Urban and Rural Archaeology. Smithsonian Institution Press, Washington, D.C.
2003 Tiwanaku Ceremonial Architecture and Urban Organization. In:	Tiwanaku and Its Hinterland: Archaeology and Paleoecology of an Andean Civilization, Vol.2 - Urban and Rural Archaeology,	edited by Alan L. Kolata. Smithsonian Institution Press, Washington. 2005	Pariti: Isla, Misterio y Poder. El tesoro cerámico de la cultura Tiwanaku. CIMA, La Paz, Bolivia. 2012	Jucusbamba. Investigaciones arqueológicas y motivos Chachapoya en el norte de la provincia de Luya, departamento Amazonas, Perú. Tarea Asociación Gráfica Educativa, Lima. 1998	The archaeology and pottery of Nazca, Peru : Alfred L. Kroeber's 1926 expedition. Alfred L. Kroeber and Donald Collier ; edited by Patrick H. Carmichael ; with an afterword by Katharina J. Schreiber. AltaMira Press, Walnut Creek, CA. 1976	Pre-columbian art of South America. Harry N. Abrams:New York. 1966	Peru. World Publishing Company, Cleveland. 2012 Intercultural relations in northern Peru: the north central highlands during the Middle Horizon. Boletín de Arqueología PUCP	16:23-51. 1984	Arte y tesoro del Peru. Banco de Credito del Peru en la Cultura. 1991	The Textile Art of Peru (Arte textil del Perú): colección / creada y dirigida por José Antonio de Lavalle y José Alejandro González García. Industria Textil Piura, Lima, Perú. 1957	Robert Woods Bliss Collection: Pre-Columbian Art. Phaidon Publishers, Inc., New York. 1959 Esquema arqueológico de la Sierra Central del Perú. Revista del Museo Nacional 28:64-117. 1960 Espacio y Cultura en los Andes	Revista del Museo Nacional 29:. 1969	Antiguo Perú. Museo Nacional de Antropología y Arqueología. Lima, Per˙. 1974	The peoples and cultures of ancient Peru. Smithsonian Institution Press, City of Washington. 1974b	Las Fundaciones de Huamange: Hacia una Prehistoriea de Ayacucho	Editorial Nueva Educación, Los Opalos No. 164, Lima. 1990	Visión arqueológica del perú milernario. Milla Batres, Lima. 2019 The Local and the Foreign in the Iconography of the Empire. In:	Images in Action: The Southern Andean Iconographic Series	edited by William H. Isbell, Mauricio I. Uribe, Anne Tiballi, Edward P. Zegarra, pp.633-658. UCLA Cotsen Institute of Archaeology Press. 1980 Las Culturas Regionales Tempranas. In:	Peru Antiguo,	v.1, Lima. 1974	Testimonianze d'arte delle culture peruviane primitive. Milano, Italy. 2004 SHCa104 Southern Hemisphere Calibration 0 - 11.0 cal kyr BP	Radiocarbon	46:1087-1092. 1984 The Middle Horizon in the Valley of Cuzco, Peru: The Impact of the Wari occupation of Pikillacta in the Lucre Basin. Ph.D. dissertation, The University of Texas. 1991 Investigations at the Pikillacta Site: A Provincial Huari Center in the Valley of Cuzco. In:	Huari Administrative Structure: Prehistoric Monumental Architecture and State Government. edited by William H. Isbell and Gordon F. McEwan. Dumbarton Oaks Research Library and Collection, Washington, D. C.
2004	What is it? Geographica: The People, Places and Creatures of Our Universe. National Geographic - regional edition April 2004, v.205, no.4. 2005	Pikillacta: the Wari Empire in Cuzco, eited by Gordon F. McEwan. Univeristy of Iowa Press, Iowa City. 2006 Ritual and status: Mortuary display at the household level at the Middle Horizon Wari site of Conchopata, Peru. Unpublished PhD dissertation, University of Pittsburgh. 2003	Viñaque style Huari jar, 1000 A.D.	Photo provided by Susan Otto, Photograph Collection Manager. 1995 Desarrollo de las comunidades prehispánicas del litoral de Iquique-desembocadura río Loa. Actas del XIII Congreso Nacional de Arqueología Chilena,	pp. 65-80. Antofagasta (1994). Museo Nacional de Arqueología, Antropología e Historia del Perú (Lima). 2015 Evidencia de uniones matrimoniales entre las élites wari y tiwanaku de Cerro Baúl, Moquegua, Perú. In:	El Horizonte Medio: nuevos aportes para el sur de Perú, norte de Chile y Bolivia. Eds.Antti Korpisaari & Juan Chacama. IFEA, pp.177-200. 2000 Andean Textiles from Village and Cemetery: Caserones in the Tarapac· Valley, North Chile. In:	Beyond Cloth and Cordage: Archaeological Textile Research in the Americas. Edited by Penelope Ballard Drooker and Laurie D. Webster. University of Utah Press, pp.229-251. 2000 Los Tejidos Huari y Tiwanaku: Comparaciones y Contextos. In:	Huari y Tiwanaku: Modelos vs. Evidencias, primera parte,	Edited by Peter Kaulicke and William H. Isbell, pp. 119-130. Boletín de Arqueología PUCP, no.4, 2001. Fondo Editorial, Pontificia Universidad Católica del Perú, Lima. 2007 Alfareros del Imperio Huari: Vida cotidiana y areas de actividad en Conchopata. Universidad Nacional de San Cristóbal de Huamanga, Facultad de Ciencias Sociales. VASPA SAC / CANO Asociados SAC - Lima, Peru. 2002 Religious ideology and military organization in the iconography of a D-shaped ceremonial precinct at Conchopata. In:	Huari y Tiwanaku: Modelos vs. Evidencias, primera parte,	edited by Helaine Silverman and William H. Isbell, pp.225-247. Kluwer Academic, New York. 1930 Textile periods in ancient Peru. University of California Publications in American Archaeology and Ethnology 28(2):23-56. 1999 Huari: Misteriosa Ciudad de Piedra	Universidad Nacional de San Cristóbal de Huamanga Gráfrica Bendezú, Ayacucho. 1964	Descripción sumaria del templete semisubterráneo de Tiwanaku. Centro de Investigaciones Arqueológicas en Tiwanaku. Publicación no. 2. Tiwanaku. 1945	Tihuanacu: La cuna del hombre americano. Tihuanacu: The cradle of American man. vol. 1/2. J. J. Augustin Publisher, New York. 1957	Tihuanacu: La cuna del hombre americano. Tihuanacu: The cradle of American man. vol. 3/4. J. J. Augustin Publisher, New York. 1977 Materiales Huaris no ceramicos en el Museo de America: Orfebrereia, textiles y pequena escultura (Figurillas de Pikillajta). Cuadernos prehispanicos (Seminario Americanista de la Universidad, Salladolid, Spain.) 5(5):55-108. 1968 Un deposito de ofrendas del Horizonte Medio en la Sierra Central del Peru. Ñawpa Pacha	6:19-46. 1970 100 años de arqueología en el Perú. Fuentes e investigaciones para la historia del Peru, 3. Instituto de Estudios Peruanos, Lima. 1986	Textile Masterpieces of Ancient Peru: with 77 illustrations in full color	Dover Publications, Inc., New York. The Necropolis of Ancón in Peru; a contribution to our knowledge of the culture and industries of the empire of the Incas, being the results of excavations made on the spot. Translated by Professor A. H. Keane. A. Asher & Co., Berlin. 1979 Textile Evidence for Huari Music. In:	Textile Museum Journal	18:5-18. 2012 Tie-dyed Tunics. In:	Wari: Lords of the Ancient Andes,	edited by Susan Bergh, pp. 192-205. Thames & Hudson, New York. 1971 The Influence of ChavÌn Art on Later Styles. In:	Dumbarton Oaks Conference on Chavín,	edited by Elizabeth P. Benson. Dumbarton Oaks, Washington, D.C., pp.101-124. 1974 Kunst in Peru und Bolivien. In Das Alte Amerika edited by G. R. Willey. Propyläen Kunstgeschichte 18. Propyläen Verlag, Berlin. 1979 Standardization in Inca tapestry Tunics. In:	The Junius B. Bird Pre-Columbian Textile Conference (May 19th and 20th, 1973)	edited by Ann Pollard Rowe, Elizabeth P. Benson, and Anne-Louise Schaffer. Textile Museum, Washington, D.C., pp.239-264. 1947	Archaeological Researches in the Highlands of Bolivia. Elanders Boktryckeri Aktiebolag, Göteborg. 2007	Chachapuma: Revista de Arqueología Boliviana. No.1, marzo. CIMA, La Paz, Bolivia. Sainsbury Centre for Visual Arts, Univ. of East Anglia (Norwich, England).
. Search "Cultural group" for 'huari style'. 1964	La cerámica Peruana prehispánica. Universidad Nacional Autónoma de México. 1983 Datos ethnohistoricos de Pomacanchi	Arqueologia Andina	1:66-74. 1998 Ritual, Power, and the Development of a Complex Society: The Island of the Sun and the Tiwanaku State. Unpublished Ph.D. Dissertation, Department of Anthropology, University of Chicago. 2004 Excavations at the Site of Chucaripupata: A Tiwanaku IV and V Temple and Domestic Occupation, In:	Archaeological research on the Islands of the Sun and Moon, Lake Titicaca, Bolivia: final results of the Proyecto Tiksi Kjarka, edited by Charles S. Stanish and Brian S. Bauer. Cotsen Institute of Archaeology, Monograph 52:93-137. University of California, Los Angeles. 1957 Highlights of Andean archaeology, 1954 - 1956. Archaeology 10(2):93-99. 2000 The Norbert Mayrock Art Collection from Ancient Peru. Staatliches Museum für Völkerkunde Munchen. 1929	Kunst und Kultur von Peru. Propylåen - Verlag, Berlin. 1992 Wari Imperialism in Middle Horizon Peru	Anthropological Papers Museum of Anthropology, University of Michigan No.87, Ann Arbor. 1990 Andean tuber crops: Worldwide potential. P.428-435. In J. Janick and J.E. Simon (editors), Advances in new crops. Timber Press, Portland. 1955 Wari: A Study of Tiahuanaco Style. Unpublished Ph.D. dissertation, Department of History of Art, Yale University. The Uhle pottery collections from Ancón. University of California Publications in American Archaeology and Ethnology 21(4):i-ii, 135-190. 2008	Ritual Beauty: art of the ancient Americas: from the collection of I. Michael Kasser	Tucson, Ariz.: University of Arizona Press. 1922	Introducción a la Historia Antigua del Perú. San Marti y Cia, Impresores, Lima. 1942 Origen y desarrollo de las civilizaciones prehistóricas andinas. Reimpreso de las Actas del XXVII Congreso de Americanistas de 1939, Lima. 1965	Ancient Peruvian textiles from the collection of the Textile Museum. Museum of Primitive Art, New York. 1987 The iconography of South American snuff trays and related paraphernial. Etnologiska Studier 37	Gˆteborgs Etnografiska Museum, Gothenburg, Sweden. 1995 Archaeological evidence for the antiquity of psychoactive plant use in the Central Andes. Annali dei Musei civici-Rovereto	11:291-326. 2006	Anandenanthera: visionary plant of ancient South America. Haworth Press, Binghamton, New York. 2012	Violence, Ritual, and the Wari Empire: A Social Bioarchaeology of Imperialism inthe Ancient Andes. University Press of Florida, Gainesville. 1927 Tonplastik aus Nazca. Jahrgang II:167-176. IPEK, Leipzig. 1952	Art of ancient Peru. Praeger, New York. 1967	On the royal highways of the Inca: Archaeological treasures of ancient Peru. Praeger, New York. 1998  Acerca de los culturas tempranas de Lima y usus alrededores, Max Uhle y el Perú Antiguo	ed. Peter Kaulicke, pp.231-254. Pontificia Universidad Católica del Perú. Fondo Editorial. 1913a Die Muschelh¸gel von Ancon, Peru. International Congress of Americanists,	18(1):22-45. London. 1913b Die Ruinen von Moche. Journal de la Société des Américanistes de Paris,	n.s., 10(1):95-117. Pls. IV-VI, Figures 1-20. 1935 Die Alten Kulturen Per˙s. Hinblick auf die Archaeologie und Geschichte des amerikansichen Kontinents. Wilhelm Susserott Velog., Berlin. 2015 Revisión de la definición del estilo Nievería: un estudio de los materiales recuperados por Max Uhle, Louis M. Stumer y la Misión Arqueológica Italiana. Unpublished tesis Lic. Arqueología, Pontificia Universidad Católica del Perú, Lima. 1981 Information exchange as seen in Middle Horizon 2 ceramics from the site of Huari, Peru. Unpublished Ph. D. dissertation, Department of Anthropology, University of Wisconsin, Madison. 2001 Wari y Cajamarca	Boletín de Arqueología PUCP, no.5. Pontificia Universidad Catolica del Peru, Fondo Editorial. 1945	Mundo vegetal de los Andes peruanos, estudio fitogeogr·fico	Nueva ed., rev. y ampliada, de Die Pflanzenwelt der peruanischen Anden. Lima, Estación Experimental Agrícola de la Molina, Dirección de Agricultura, Ministerio de Agricultura. 1980	Birds of Prey of the World: A coloured guide to identification of all the diurnal species order Falconiformes. Verlag Paul Parey, Hamburg und Berlin. 2002 Too many ancestors. Anitquity	76(2002):119-126. 1995 El significado cultural del uso de tabaco en Sudamérica. Act Americana	3(2). Journal of the Swedish Americanists Society. A supplement to the pottery sequence at Ancon. Columbia Sutdies in Archeology and Ethnology	1(4):i-iv, 201-211. 1949 Ceramics. In	Handbook of South American Indians: v. 5. The comparative ethnology of South American Indians. Julian H. Steward, editor, pp.139-204. U.S. G.P.O, Washington, D.C.
1934 El mundo vegetal de los antiguos peruanos (conclusion). Revista del Museo Nacional	3(3):243-322. 1935 El mundo vegetal de los antiguos peruanos (conclusion). Revista del Museo Nacional	4:31-102. 1972 Meaning in Nazca art. Göteborgs Etnografiska Museum Arstryck, pp. 35-54. Göteborg, Sweden. 1977 The Inca Calendar. In:	Native American Astronomy,	editted by Anthony F. Aveni. University of Texas Press, Austin. Pp. 219-259.